This piece originally appeared on Scroll.in on March 12, 2017. The founder of the Revolutionary Love Project shot into the spotlight with an inspirational New Year’s Eve speech. On New Year’s Eve, Valarie Kaur, a documentary filmmaker and civil rights activist based in Los Angeles, California, delivered a moving speech at a historic African-American church in Washington DC. In her speech, she spoke of the dark times ahead and how instead of leading to despair, this could be an opportunity for change. “Last year, distraught by the rise in hate violence during the election season, I had a moment of personal crisis. I left my job at Stanford Law to reflect on what’s missing in our movement. Through reflection, I realised that what we most need aren’t new policy solutions but a different way of fighting for them. Political tactics are not enough: No number of policy wins will end what the Southern Poverty Law Center has called the era of “enormous rage”. If anything, conventional organising tends to mirror the kinds of demonisation, suspicion, and distrust that we seek to oppose. We need new ways of fighting for our values and seeing people who are different from us [racially, religiously, and politically] as sisters and brothers whose destinies are tied with ours. We need a new ethic. The project has coordinated 100 film screenings and dialogues, and urged people to vote during the elections. After the inauguration of Donald Trump as president in November, it also joined forces with movements such as One Billion Rising, to end violence against women, and the Women’s March on Washington, a worldwide movement for women’s rights and against the Trump presidency that took place on January 21-22. Kaur is now writing a book about Revolutionary Love. In an email interview, she talks about growing up as a Sikh in America and of her activism. The story of your grandfather – how he traveled from Punjab to California by steamship 100 years ago, was arrested and jailed for months by immigration officers, and struggled to make a life in America – is incredibly moving. Was this story a part of your life as you were growing up? How did it influence you? I grew up with stories of my grandparents and ancestors, and these stories made me feel connected to my Sikh faith and American heritage. My grandfather’s story showed me what it meant to be an American – to love our neighbours as ourselves, even in dangerous times. That’s when our love becomes revolutionary. As a Sikh in America, how has the country changed for you and the people you know in the last few years? Has the nature of the fear begun to shift as well? The current crisis in hate violence in America is only the latest chapter in an epidemic that began more than 15 years ago in the aftermath of the September 11, 2001 terror attacks. Since then, a new racial category of the “Muslim terrorist” has become embedded in the American racial landscape. Sikhs, Muslims, Arabs, and South Asians are part of that racial category. Every time the government targets our communities, it emboldens people to act on their stereotypes against us. Since the current president rose in power, his rhetoric and now policies consistently punish our communities. It’s no surprise that hate crimes against our communities has now skyrocketed. On February 22, Srinivas Kuchibhotla was murdered by a gunman in Kansas who said “get out of my country” before he opened fire. His murder appears to be the first fatal hate crime since Trump’s inauguration. I was devastated by the news and flashed back to 15 years ago when Balbir Singh Sodhi became the first person to be murdered in a hate crime after 9/11. Like Balbir Uncle’s murder, Srinivas’ murder is not an isolated incident. It’s part of a larger climate of fear, hate and vitriol, and foretells more violence to come. My solace is that millions of people are politically awakened now like never before and ready to stand in solidarity with us and other communities in harm’s way. There is a perception of Indians as the “good minorities” who do not speak up for the rights of other communities in danger. Do you think this is accurate and is it changing now? When I became an activist 15 years ago, there were few other South Asian Americans who were pursuing this path. For most of my college years at Stanford University, I was the only Sikh undergraduate I knew who was not studying medicine. That’s changed. 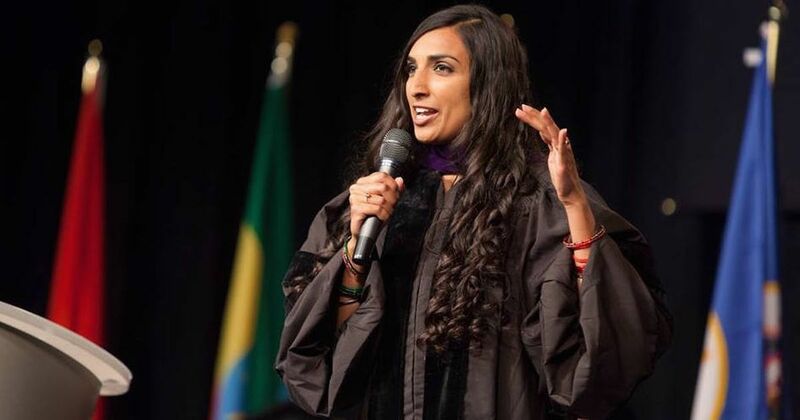 In the years since 9/11, we have seen a new generation of South Asian Americans rise up and pursue careers in law, politics, business, media and advocacy. Today I’m proud to be part of coalitions of South Asian Americans who are on the front lines of fighting for social justice. You had a particularly strong message claiming solidarity across different communities that face discrimination in the United States today. Is there any instance of building solidarity in the recent past that has particularly moved you? In my 15 years, I have worked with many communities fighting on a wide range of issues – hate crimes, racial profiling, immigration detentions, solitary confinement, marriage equality, and internet freedom. In this work, I have discovered that our struggles are interconnected. We are part of one broad movement for civil rights and human dignity. I believe it’s the old way to fight only for our own communities or causes. The future of our movements calls for deep solidarity. I have seen this solidarity in the last few years, including at protests for Black Lives Matter, vigils at Standing Rock [by Native Americans against under-construction oil pipelines], and at the Women’s March. I witnessed this solidarity up close in the wake of the 2012 mass shooting at a Sikh gurdwara in Oak Creek, Wisconsin. Our multi-faith coalition along with Sikh advocates were able to secure lasting policy change on hate crimes. When we organise together and raise a collective voice for social justice, we can create lasting policy and culture change. You also spoke of how this period of darkness might be the darkness of a womb, not of a tomb. How are you and others working to, as you say, “push”? I launched the Revolutionary Love Project in order to support the broader movement. Revolutionary Love is the commitment to extend our will for the flourishing of others, our opponents and ourselves. Love is not a passing feeling but a commitment to action. When we practise love in the face of fear or rage, then we can transform an encounter, a relationship, a culture, or a country: Our love becomes revolutionary. In this moment of political and moral crisis, millions of people have joined the movement for justice. We will burn out if we run on fumes; we may even mirror the distress, hate and fear that we are resisting. But the ethic of love can ground our moral resistance and sustain our movement for months and years to come. I believe Revolutionary Love is the call of our times.